StormChamberTM storm water chambers are a solution for storm water retention, detention, recharge and re-use which reduces the impact of storm water on public systems and reduces flooding. 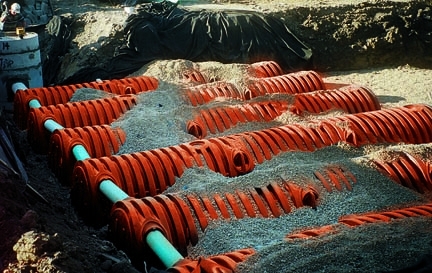 StormChamber is an underground system that consists of open bottom corrugated arch shaped units The system may be used under paved or unpaved areas and backfilled up to 7.6 m deep. StormChamber capable of supporting loads up to 1149 kpa (24,000 pounds per square foot) which is three times the AASHTO H-20 Wheel Load Rating. The StormChambers may also be installed in a two layered configuration with the top layer placed at right angles to the lower layer with 305 mm (12 inches) minimum clearance between layers. Each chamber is formed from high molecular weight /high density polyethylene. Dimensions of each modular section are 2.59 meters (8.5 feet) long, 1.524 meters wide and 0.863 meters (34 inches) high. The SedimenTrap component is also available as part of the system for collection, inspection, and removal of sediments.